All Source | All Source is a proud part of the Mill Street & Co. Group of companies. 19 Sep All Source is a proud part of the Mill Street & Co. Group of companies. –Toronto, September 13, 2018 – Canadian Business and Maclean’s today ranked Mill Street & Co.(“Mill Street”) No. 3 on the 2018 Startup 50 ranking of Canada’s Top New Growth Companies. Servingas a companion list to the longstanding Growth 500 ranking of Canada’s Fastest-Growing Companiesand produced by Canada’s premier business and current affairs media brands, the Startup 50 ranksyounger companies on two-year revenue growth. Startup 50 winners are profiled in a special print issueof Canadian Business published with Maclean’s magazine and online at CanadianBusiness.com. 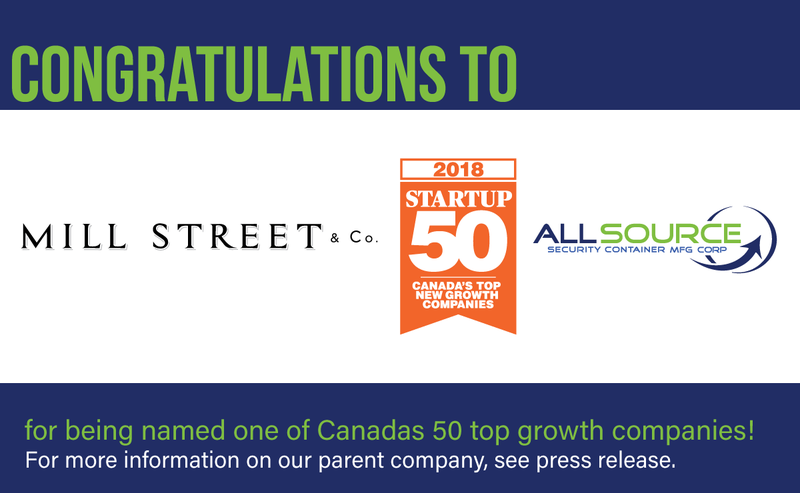 Mill Street & Co. took the third spot on the 2018 Startup 50 list with two-year revenue growth of 3,280%. Ranking Canada’s Top New Growth Companies by two-year revenue growth, the Startup 50 profilesthe fastest-growing startups in the country. It is a companion list to the Growth 500 ranking of Canada’sFastest-Growing Companies, which has, for 30 years, been Canada’s most respected and influentialranking of entrepreneurial achievement. Both the Startup 50 and Growth 500 are published in a specialissue of Canadian Business published with Maclean’s magazine and at CanadianBusiness.com. Formore information on the ranking visit Growth500.ca or CanadianBusiness.com. Founded in 1928, Canadian Business is the longest-serving and most-trusted business publication inthe country. It is the country’s premier media brand for executives and senior business leaders. It fuelsthe success of Canada’s business elite with a focus on the things that matter most: leadership,innovation, business strategy and management tactics. Learn more at CanadianBusiness.com. Mill Street & Co. is a diversified North American management company that is focused on the creationof real value for all stakeholders – employees, customers, investors and the communities in which itoperates. Employing over 1000 exceptional people, Mill Street generates sustainable, long-term valuethrough the intelligent allocation of capital. An approach that we call SMART Capital®.